There is no way you can miss Mount Lycabettus. 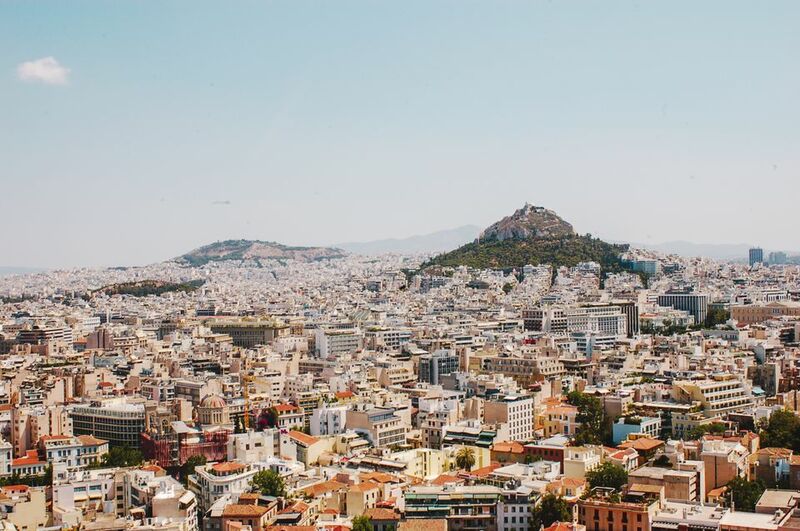 The tallest of Athens' seven hills rises abruptly out of the middle of the city and like the Acropolis, which it towers above, it is visible from almost everywhere. It almost begs to be climbed and sooner or later, if you have a spare afternoon in Athens and you are even moderately fit, you are going to be tempted to have a go. Here's everything you need to know to about Mount Lycabettus, about climbing to the top and about what's up there. At 277 meters (909 feet) it's a bit less then twice as high as the Acropolis. (The word Acropolis means summit of the city but when it was built, Lycabettus was outside the city limits.) The views from the top take in the whole of Athens, across to the sea and deep into the mountains of the Peloponnese (more about the views later). You can take your pick of the fanciful reasons it is named Lycabettus. Some say it was once a place where wolves wandered—lykoi is the Greek word for wolves. Another story relates that while Athena was carrying a hunk of mountain back to the Acropolis to add to her temple there, a bit of bad news disturbed her and she dropped it. The rock she dropped became Lycabettus. Mount Lycabettus or Lycabettus Hill? Either and both actually. Even though it's less than 1,000 feet high, the dramatic, limestone outcrop at the top definitely looks like a mountain. But its lower slopes are covered with residential districts including the expensive homes and blocks of flats of the Kolonaki district. And as you climb its streets and the flights of steps that connect them, it is more of a rather steep hill. So take your pick. Locals call it both. The main reason people climb Lycabettus is to enjoy the astonishing 360° views from Athens' highest and most central point. To the Southwest: If you are like most visitors to Athens, you will want to see the Acropolis and Athens' sacred mountain, topped by the Parthenon, and the Erechtheion is easy to spot. At twilight, when the sun sets to the west and the Acropolis lights up, it is particularly beautiful. The sea of red-tile roofs in front of the Acropolis is Plaka, Athens' oldest district. Just south of the Acropolis—or left from your viewpoint—is the Acropolis Museum. It looks a bit like a stack of boxes when seen from above. Closer from this viewpoint, between you and the Acropolis, is Syntagma Square. You can spot it by the low horizontal, pale yellow building that spreads across it. That's the Greek Parliament. The large building to the right of it is the Hotel Grande Bretagne. To the South: Kolonaki, Athens' affluent residential area, climbs the lower slopes of Lycabettus from the southwest and south. The broad green area south of Syntagma Square (left from your viewpoint) is the Greek National Garden with the bright yellow Zappeion, a 19th century building used for official functions and exhibitions, in the middle of it. South of this (further left from your viewpoint), look for a long, U-shaped building. That's the Panathenaic Stadium where the first Modern Olympic Games were held in 1896. Reconstructed on the site of an ancient stadium, dating from 566 BC, it is built entirely of white marble. Today it is where the Olympic flame is lit and from where it begins its journey. To the West: Look across the red tiled roofs of the Panepistimiou campus of Athens University, into the district known as Omonia. You might be able to make out the glass and steel roof of Athens Central Meat and Fish Market and, beyond the neighborhoods of Psyrri and Thissio and the crowded market streets of Monastiraki. To the Northwest: Look for the National Archaeological Museum, a large classical building with gardens in front of it. This is one of Athens' best museums and is often overlooked because it is separate from the main tourist areas. To the North: The dark, green round-cornered square is Lofos Strefi or Strefi Hill, another of Athens' seven hills. It's a tree covered area on the edge of the Exarchia district and people say it offers the best view of Lycabettus. To the East: Looking directly to the east you can see another route down through wooded hills to a residential neighborhood also known as Lycabettus. The colorful, orange and yellow amphitheater just below the summit to the east is Lycabettus Theater where outdoor performances, concerts and plays are staged in the summer. It is a modern addition, built into a former quarry in 1965. Once you are clear of the urbanization at the bottom of Lycabettus, the lower slopes are covered with fragrant, shady pine woods that feel as though ancient nymphs and satyrs should be scampering through them. Don't be fooled. The forest was planted in the late 1880s as a ploy to prevent erosion and quarrying from eating away at Lycabettus. It was only fully established in the early 20th century. Above the trees, the trails to the top are bordered with typical desert flora—cactus, prickly pear, and the usual assortment of spiky, dusty, but not very interesting plants. If you are sharp eyed and you know your plants you might see small clumps of cypress, eucalyptus, and willow. There are some olive, almond and carob trees but these, like the pine woods, have been planted and aren't native to the hill. Be on the lookout, instead, for the birds; twitchers have reported 65 different species including kestrels and hawks. Of course, most of these high fliers can be spotted on all the wooded hills of Athens. The real animal kingdom stars of Lycabettus are the Greek tortoises that are native to the hill. They can reach a length of 20 cm (just under 8 inches) and are known to live more than 100 years. They are also pretty fast for tortoises and can disappear into the undergrowth before you know it. The tortoises are considered a vulnerable species, so whatever you do, don't try to catch one. The tiny, 19th century Agios Georgios—the Chapel of St. George—caps the summit of Lycabettus. It has some moderately interesting frescos but frankly it is more interesting from the outside than it is inside. If it is open, it offers a bit of shade. The church is surrounded by a wide viewing platform which has a few benches and, in places, a low wall you can sit on. It also has a coin operated binocular viewer. But there's just the one and at the height of the season you'll be lucky to get near it, so best bring your own if you can. Beside and slightly below the church, Restaurant Orizontes is a relatively pricey seafood restaurant more notable for its twilight views than its food. The Café Lycabettus, also near the top doesn't get many good reports. Stop there for a rest, a coffee and perhaps a sweet before heading back down. There are several different routes to the viewing platform and church at the top of Lycabettus. Before you start out, be realistic about how much you like to climb steps because, with the exception of taking the funicular, most routes do involve steep stretches over wide, easy to navigate but long runs of steps. Wear comfortable, sturdy shoes. Yes, we know people report they've gone up there in flip flops but people do a lot of silly things, don't they. Be safe and wear sensible shoes. Wear a sun hat of some kind because a lot of the route is exposed to the blazing sunlight and carry a bottle of water. It can take anywhere from thirty to 90 minutes to walk to the top depending on how fit you are. It is not a difficult walk but it is a steep and prolonged walk. A lot of visitors take the cable car, called the Teleferik, to the top and then walk down which can be a sensible alternative. The Teleferik: Lycabettus's unique cable car goes up the mountain from the intersection of Aristippou and Plutarchiou Streets. It's a three-minute ride through a steep tunnel that costs €7 for a round trip or €5 one way. Lately they've been projecting random lights and words on the inside of the tunnel so you don't go up in complete darkness—but of course, there are no views. The nearest metro station is Evangelismos. It's a steep climb, with about 200 paved steps, from the metro to the Teleferik so if you have any mobility issues, take a taxi right to the Teleferik station. The Teleferik runs from 9 a.m. to 1:30 a.m. It sometimes runs later so it's a good idea to ask—if you're planning a late night at Orizontes—when the last car descends). Walk from Aristippou: Facing the Teleferik station, take Plutarchiou Street uphill to the right. After several short flights of steps, turn left at the top of Plutarchio and you will see the entrance to a path uphill. This is the most popular path to the top. It is a wide, paved zigzag with occasional shallow steps. At the very top there is a run of about 60 marble steps that end on the viewing platform outside the church. This path emerges from the trees almost immediately and is completely exposed to strong sunlight. The vegetation that runs along beside it is mostly cactus and prickly pear. During the high season, this path has the most traffic because it has the best views all the way up. It is also one of the fastest ways to walk up. For more forest cover: If you start your walk on the path leading up from Ilia Rogkakou, you can climb through pine woods for about 20 minutes before joining the zigzag path mentioned above. Ilia Rogkakou is the name of the west side of the circular road that winds around the base of Lycabettus (this road changes its name several times). The Number 60 bus to Lycabettus goes along this road. The path begins at a set of stone steps on the uphill side of the road. It is pretty and fragrant but also steep in places and slippery from pine needles. The walk or drive from Sarantapichou: Sarantapichou is the name of the circular road at the base of the hill on the north side. There is a paved road, that zigzags up from this direction to a T-junction. If you turn right at this junction, you reach a small parking area for the cave Church of St. Isidore. There are steep steps up from the parking to the cave but, unfortunately, unless you are lucky enough to arrive in time for a special feast day, this church and the path to it are usually closed. Continue on this road to the next small parking area. At the western end of this parking area a sign leads to steps that arrive at the bottom of the popular zigzag path. The drive from Sarantapichou or Daskalogianni: At the T-junction, turn left this will lead you to the large parking area for the Lycabettus Theater. There is also a road from Daskalogianni that rises from the east side of the hill to the theater parking. From the theater, a path heads uphill and west to the viewing area. It is a wide paved path with several short flights of steps. This is probably the easiest way up for walkers. The path is lit at night and has a handrail and views to the north. One way or another, unless you take the Teleferik, you will have to plan on climbing part of the way. Where Can One Find Cheap Flights to Athens, Greece? What Are Some Easy Greek Translators on the Web?